Wanted to take a moment to thank everyone that checks in on this site. I haven’t had hardly any time to add to, or update, the site. Started a new job in January of 2016, and then our daughter was born last year. Maybe I’ll find the time to add more to the site, I’ve got a lot of photos saved, and some other information, just do not have the time these days. Always shocked to see how many people visit everyday still. I still love Kamaka, and play mine as much as possible. As for now though, the site is as complete as it will get. Hopefully in the future we’ll have some updates. Thanks! Because of the popularity of the four-stringed instrument, a family-run island business has been around for 99 years. Everyday, employees of the Kamaka factory shape, sand and meticulously craft more than a dozen ukuleles. But instead of being known for the quantity of instruments it produces, Kamaka is known for its quality. “Our instruments are made to last generations, passed down to son or daughter and then grandson or daughter. So we have to make our instruments to last a lifetime,” said Fred Kamaka Jr., the business manager for Kamaka Hawaii. The same could also be said of the business itself. It has been passed down between generations of Kamakas. “This business was started by my father Sam Kamaka Sr.,” said 90-year old Fred Kamaka Sr. to a group gathered to the tour the factory. The family business began back in 1916. “Everything made in Hawaii at the time was high pitched like the violin, or mandolin sound,” said Fred Kamaka Sr. But Sam Sr. discovered a way to make the little ukulele sound bigger. “One of the reasons we survived is my grandfather invented the pineapple ukulele, which made his name and his business,” said Fred Kamaka Jr.
For 99 years, Kamaka Hawaii has been making small instruments that make a big impression on musicians. “the ukulele is a happy instrument. I love the sound and what I can do with it, that includes sharing a part of me through the ukulele,” musician Bryan Tolentino said. Sharing is a big part of the ukulele’s universal appeal. The instrument is tiny enough to be taken anywhere, and can often be found when groups of local friends get together. “We grew up that way. Friends after school would pick up the ukulele, learn new songs and share what we know with everyone,” Tolentino said. Chris Kamaka, the production manager at Kamaka Hawaii, uses his talent as a musician to make sure each ukulele sounds perfect before it leaves the factory. “My dad and my grandpa always told us the bottom line is the sound of the instrument,” said Chris Kamaka. He is just one of many workers who have a hand in the construction of the ukuleles. It not only takes two dozen employees but also 4 years. Blocks of koa wood have to be aged properly before they are cut into the pieces that make up the various instruments. 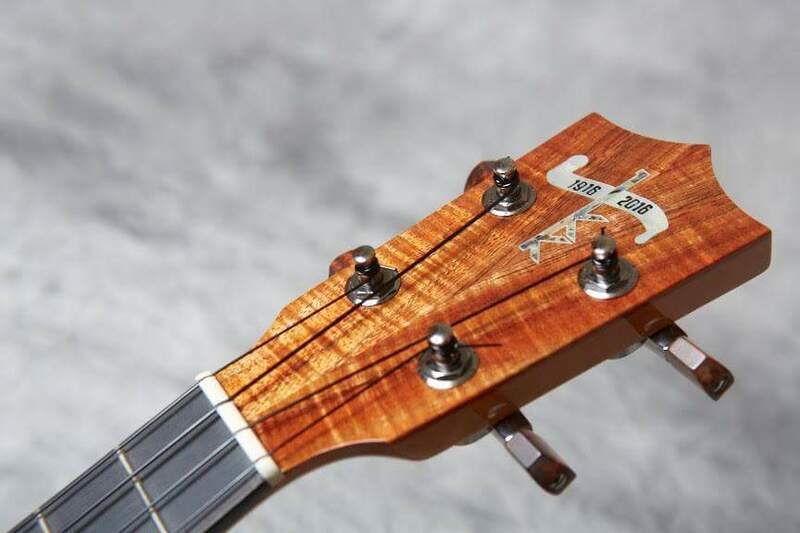 The finished products include the smaller-sized soprano model with the signature pineapple ukulele, three larger models, 6 and 8 string versions, and custom creations. Because of the pineapple ukulele’s important part of the company’s past something special is being planned for the 100th anniversary next year. “We’re looking at making a special limited edition model and it looks like it will be a pineapple ukulele,” Fred Jr. said. As the Hawaii business prepares to turn a 100, there is already a fourth generation of Kamakas working to make sure there will be ukuleles for many more years to come. I blame the heat. The glorious 35-plus degree Hawaiian temperature that turns my skin the colour of a barbecued pork chop and makes me do things I wouldn’t normally dream of doing, such as wearing a bikini, drinking cocktails adorned with umbrellas and, on one particularly unfortunate occasion, attempting the hula. But nothing sets the humiliation bar higher than learning how to play the ukulele. This is how the conversation goes: “Wouldn’t it be cool to learn how to play the ukulele in the spiritual home of the ukulele?” asks my husband. I’m still not convinced but we’re on holiday, it’s a beautiful day – as it nearly always is in this cluster of tropical islands strewn across the Pacific – and an adventure of the cultural kind seems the perfect counterpoint to Honolulu’s sun, surf and sloth. If we’re going to make fools of ourselves, we reason, we might as well do so in spectacular fashion. So we drive across the island to Kamaka Ukulele, one of Hawaii’s oldest and most respected ukulele factories, where we quickly realise our first mistake. “If you can’t pronounce it, you shouldn’t be playing it,” jokes Fred Kamaka, the 90-year-old son of Sam, who founded the two-storey factory in 1916. It turns out that Hawaii’s distinctive stringed instrument is pronounced “oo-koo-lay-lee” not “you-ka-lay-lee”. Fred explains how Portuguese immigrants contracted to work on Hawaii’s sugar-cane plantations in 1879 brought the ukulele with them. The locals were captivated by how easy it was to play and carry these melodic instruments, particularly the guitar-playing Sam. And so was born the Pineapple Ukulele, which remains the company’s biggest seller (there are eight other models, including their most expensive, an eight-string monster that Sam designed in 1976 to commemorate the US bicentennial). These days, the fourth generation of Kamakas has taken over the company reins. With the vigour of a man half his age, Fred leads us around the factory, showing us how the ukuleles are constructed out of Hawaiian koa wood which is dried and stretched before the mahogany necks and rosewood fingerboards are added. It wasn’t so long ago that the ukulele was an object of derision, regarded more as an oddity than a serious instrument. But photos of smiling celebrities in the adjacent shop show how the so-called “happy instrument” has come back into vogue with the likes of Lady Gaga, Bill Cosby, Eddie Vedder of Pearl Jam, Ziggy Marley and the cast of Glee being the proud owners of Kamaka Ukuleles. “If everyone played the ukulele, the world would be a better place,” says Jake Shimabukuro, a ukulele maestro who Rolling Stone magazine called “a hero”. We’re honoured to have the ukulele flag-bearer as our teacher; he’s normally more booked up than Madonna’s plastic surgeon (it turns out that our tour guide is his cousin who convinced him to give us a lesson). The first and only solo ukulele recording artist in the world, Jake warms up with a rendition of Queen’s Bohemian Rhapsody. As his fingers fly across the strings, I begin to understand why ukulele means “jumping flea” in Hawaiian. And then it’s our turn. Jake hands us an instrument and leads us through the basics of how to hold the ukulele, pluck it and strum a few chords to extract the dainty, nimble sound that’s softer than a mandolin and sweeter than a banjo. I try my best to mimic Jake’s movements but the chap next to me, a guitar player, has bucket loads more talent and puts me off. Somehow I manage to muddle through the Beatles’ Love Me Do, hoping my passable singing voice will make up for my inept playing. It’s surprisingly hard on the pads of my fingers and I’m thankful when Jake stops to tell us about playing for the Queen, jamming with director Francis Ford Coppola and appearing in the Adam Sandler film Just Go With It. Against my better judgment, I agree to have another try, strumming along to Incy, Wincy Spider. Neither my husband nor I fare much better the second time around, but I can see how addictive it could be. The writer was a guest of the O’ahu Visitors Bureau, gohawaii.com/nz/oahu.